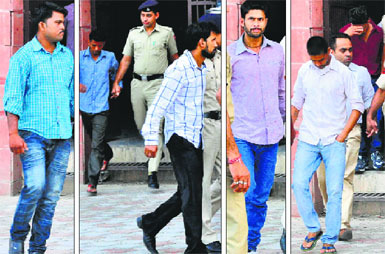 Two years after a youth was brazenly killed outside Aroma Hotel in Sector 22, the court of Additional District and Sessions Judge KK Kareer today convicted all eight accused in the case of culpable homicide not amounting to murder. The court convicted all eight accused under Sections 304, 147, 148 and 149 (rioting) of the IPC. The quantum of sentence will be pronounced tomorrow. 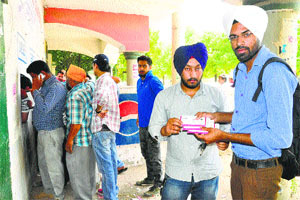 In yet another incident highlighting poor policing and lax security at the UT District Courts in Sector 43, one of the convicts in the case, Sukhjit Singh Sooch, who was out on bail and whose Scorpio was used in the crime, managed to give the police and the court authorities the slip and was found missing from the court after the orders of conviction were pronounced by the Judge. As the court pronounced the orders convicting the accused, none of the family members of the victim were present in the court today. "We know God is with us and are satisfied with the order. What would have I achieved by coming to the court today? Can the court bring my son back? My blood would have boiled on seeing the accused, I could not have faced the killers of my son," said Harminder's mother Harmesh Kaur, a resident of Sector 55. "I lost my husband last year as he was very tense after our son's murder. The incident shattered our family. My younger son and I are the only ones left now while we were a happy family of four two years ago. Nothing is left for me now," she said. 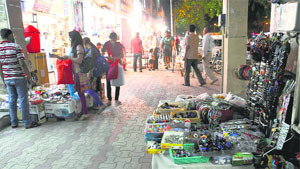 The UT Administration and the municipal corporation have decided to go soft on encroachers in the city, especially in the markets. Following a letter received from the Union Ministry of Home Affairs (MHA) to include the imprisonment clause for encroachers in their proposal, UT and MC officials today held a meeting, chaired by UT Adviser KK Sharma, which decided against a jail term for encroachers. Over the past seven years, the UT Excise Department “systematically” allowed liquor manufacturers an upper hand in annually increasing the ex-distillery price (EDP) of different brands of liquor by over 45 per cent. The menace of stray dogs prevails on the premises of the local municipal corporation (MC) as well. 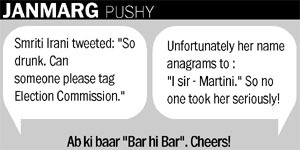 The civic body is dealing with the menace in the city. Vikram (29), who works as a driver, was attacked by stray dogs inside the MC building. He said as soon as he stepped out of car in the parking area inside the MC building last evening, a pack of stray dogs attacked him. Teams of the UT Estate Office (EO), led by Inspector Parveen Mittal and Anil Narad, today sealed two booths at Krishna Market in Sector 41 here. In both the cases, the allottees had died and the properties were in illegal possession. Sources said the EO would seal four more booths in the coming days. Even three days after a woman was allegedly raped in Hotel Shivalik View, Sector 17 here, the UT police have failed to arrest the accused, a former District Health Officer (DHO). The special investigation team (SIT) constituted to probe the mysterious death of advocate Saman Dhankar visited the accident site in Morni near here today. A sudden change in weather due to dust storm late in the evening today led to fall in the minimum temperature in the city. Power supply to some sectors was disrupted due to the storm. 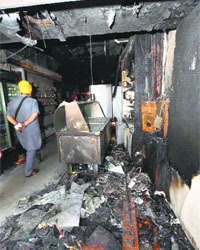 Goods worth lakhs of rupees were reduced to ashes in a major fire that broke out at a bakery and sweets shop at Sector 11 here last night. The cause of the fire is reported to be an electrical short circuit. However, the exact loss of the property could not be ascertained at the initial stage. Successful results have started emerging with the beginning of the online service of organ donation by the Post Graduate Institute of Medical Education and Research (PGIMER) as the number of donors has increased manifold. The district administration has chalked out an elaborate security plan to prevent any untoward incident during its demolition dive to be conducted in Sector 52 here on May 10. The protesting Indian National Lok Dal (INLD) MLA from Kalka, Pradeep Chaudhary, along with his supporters and party workers today blocked the busy Panchkula-Yamunanagar highway for over 20 minutes putting scores of motorists to hardship. The shooting incident at Phase VI here, in which the police arrested mother-daughter duo (Dolly Rani and Ritu) yesterday, took a new turn when the victim, Kushhal Kapoor, aka Shine, is said to have changed his previous statement made to the police. Now, the victim claimed that the women were not present at the time of the incident. 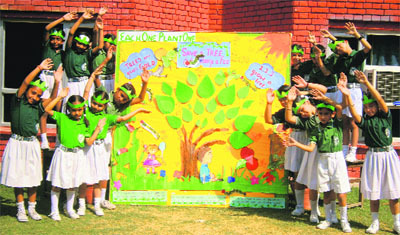 Mukat Public School, Rajpura, will host a regional-level science exhibition from May 11 to 13. The school authorities said the objective of the exhibition was to provide a common platform to schools to express and share their creative and innovative ideas. 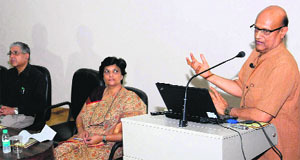 The Indian Red Cross Society, Chandigarh branch, today celebrated World Red Cross Day. “My red cross story and my red cross crescent story” was the theme of the occasion. Kids turned away by govt schools? Seated in one corner of the house, Kavita is lost in thought. A resident of Dhanas Rehabilitation Colony, she had dreams of sending her son, Nikhil, to a school this year. The Student Organisation of Panjab University (SOPU), has announced its new panel for the student council elections to be held in September 2014. The party’s founder and ex-president, Dayal Partap Singh Randhawa announced Amninder Mann of the Law Department as the president and Rupinder Sharma of the Education Department as the chairman. Several new food processing technologies can help in meeting challenges of food security and food safety. This was stated by Prof Vijaya Raghavan, James McGill Professor at the McGill University, Quebec, Canada, today. St John’s High School celebrated World Heritage Day by organising an inter-school contest on the campus today. Students from 12 schools participated in the competition. 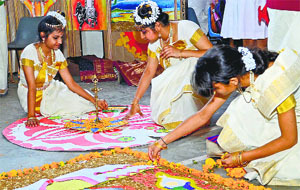 In the first competition, the students depicted the folk art of an Indian state through rangoli. Chandigarh: The tiny tots of Ajit Karam Singh International Public School-41 Smart School celebrated Mother's Day along with their mothers on the school premises today. The students of the pre-primary wing presented a show for their mothers. They sang songs, poems and danced on foot-tapping song, “Mother, mother, dear mother”. A resident of Burail village in Chandigarh was killed in a road accident on the Ambala-Chandigarh road near Ambala city this evening. Less than two months after the ball landed back in court with the Punjab and Haryana High Court indicating that the lease row would now be decided on the judicial side instead of mediation, a Division Bench today issued notice to the UT Administration. 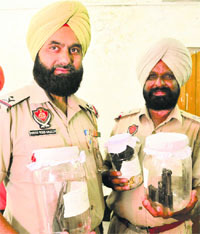 The police claimed to have cracked the robbery cases of two jewellers - one at Naya Gaon and the other at Mullanpur Garibdass - with the arrest of two history-sheeters Jagdeep Singh, alias Johny (25), and Harjinder Singh, alias Billa (27), following a brief encounter at Kheri Gujran village in Dera Bassi last night. Thieves struck at five flats of Rail Vihar, a housing society, in the Mansa Devi Complex, Sector 4, in broad daylight today. 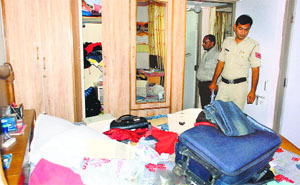 They decamped with cash and valuables worth lakhs of rupees. A private bank official has been arrested after his wife allegedly ended her life at their residence in Sector 68 here today. St Stephen's School, Sector 45, will host the 17th edition of the St Stephen's Carrom Ranking Tournament on the school campus, under the aegis of the Chandigarh Carrom Association, from May 24 to 26 here. The Chandigarh Handball Association will host selection trials to select girls' (junior) team at the handball courts of DAV Senior Secondary School, Sector 8, here, on May 9 (4.30pm). Kings XI Punjab in association with the Kalinga Institute of Social Sciences (KISS), Bhubaneswar, will invite 300 children to watch an IPL match in Cuttack on May 11. They will get a chance to interact with their favourite cricketers who, in turn, inspire them to work towards a brighter future. Local boxer Shubham Singh has been selected to attend the national coaching camp for junior boxers to be held at Aurangabad from June 14 to July 15. It will be held under the aegis of the Sports Authority of India.